The main purpose of the journal is to research the formation and use of the fundamental asset of the organization that provides the efficiency of its operations - knowledge (intellectual capital). The journal focuses on researchers, scholars and students specializing in the management of organizations, managers-practitioners. 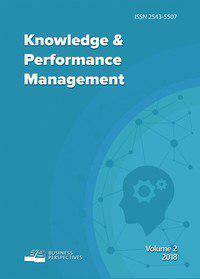 Topics covered by the journal: Knowledge as a key factor in the success of the organization and efficiency of organizational processes, Concept and theoretical principles of knowledge management, Knowledge creation by organization, Problems of identification, recording and preserving knowledge as an asset of the organization, Distribution and application of knowledge by organization, Knowledge exchange, Technological aspects of knowledge management, Estimate of costs of knowledge creation, knowledge value, Applying knowledge in the production of innovative goods and services, Specialization training in knowledge management, Universities as knowledge production organizations, Knowledge transfer innovations in universities, Knowledge management system in student’s education process, Knowledge accumulation bases and systems in universities, Science publishing and journals in the system of knowledge transfer.